Our corporate supporters help us change lives and make sure that victims and survivors, and their families, are made safe and are given the right support to rebuild their lives. Domestic abuse affects two million people a year and it’s estimated that it costs British businesses over £1.9 billion. It will be affecting the people your organisation cares about most - your staff, clients and customers. Every partnership is different. Our fundraising team work closely with companies to build long term, tailored relationships. 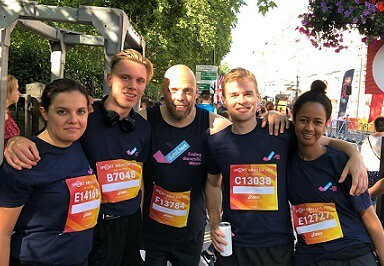 A huge thank you to the recruitment company Prospectus for supporting SafeLives - staff took on the challenge of a 10k run and held an office bake sale, raising a fantastic £1,690. Cause-related marketing: speak out about domestic abuse and build your brand. Show your customers that you are a forward-thinking business that cares. Stand out from your competitors and champion a cause that some companies might shy away from and that is increasingly on the public agenda. Team building: fundraising is fun and boosts team spirit! Bring your team together to make a difference and meet your corporate social responsbility targets. Make a difference: over two million people in the UK experience domestic abuse every year. You can change lives and help us make sure that nobody has to deal with domestic abuse alone. Talk to us about getting your company involved. Please contact us at fundrasing@safelives.org.uk or call 0117 403 3220 and ask to speak to someone in our fundraising team.